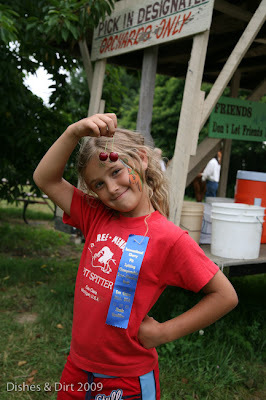 Dishes & Dirt: International CHERRY PIT SPIT! I do something a little different every 4th. 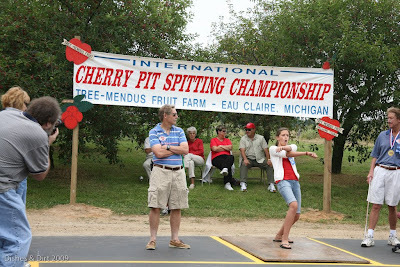 When I found out about the annual International Cherry Pit Spitting Contest held at Tree-Mendus Fruit Farm in Eau Claire, MI- I knew it was the perfect adventure. So I packed up the car and headed down and around the lake. But no 4th is complete without a small town parade. So it was just my luck upon riding into town that I discovered I was just in time to catch the slice of Americana I was looking for: Perfectly detailed floats carrying teenage pageant queens and farmers rolling bright green antique John Deere tractors down Main Street, U.S.A.
After the show, I was again on my way to Tree-Mendus Orchards- and arrived to catch the Women's and Men's Championship Rounds. This was the real deal- some Serious pit spittin' like I had never seen before! 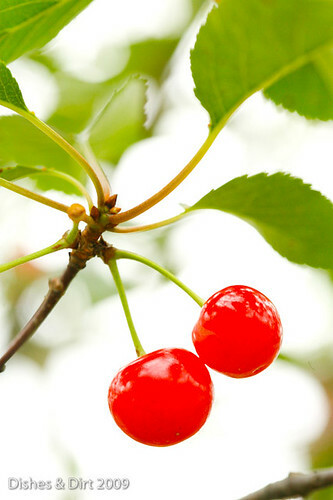 I ate a cherry brat and contemplated a cherry waffle "boat" while thoroughly entertained by the face and body gestures- and impressed by the distances the pits were projected. After the spittin' ceased, and the Champions prized, I scoped out the grounds and snapped some photos. (Actually only a tiny fraction of it because it really is "Tree-Mendus"- including a store, picnic areas, goats, and pie cherry pitting facility.) I met family members Cindy & Olivia who took me for a horseback ride and practiced some pit spittin'. Later that evening I had a chance to meet members of the Teichman family- including founders Liz and Herb. They gave a little background about the farm and stated that one of their visions over 30 years ago was to provide a country haven for city dwellers- towering blocks of concrete in exchange for infiinite rows of trees dripping with fruit. Its the perfect one-day getaway- solo or for a big ol' group.